Every year I do some type of Christmas cookie that combines peppermint and chocolate. 2016’s creation is Chocolate Peppermint Crinkles, this little number pictured above. Look at her… I’m being totally modest when I tell you she’s amazing. But it’s not just one cookie recipe I get to share with you today… There are seventeen others. Wait, what?!? I know…who knew life could be this good. To help you with all of your holiday cookie needs, I teamed up with an amazing group of food writers + recipe developers and we each created a new holiday cookie. We’re sharing these recipes today…all of the recipe links are below. 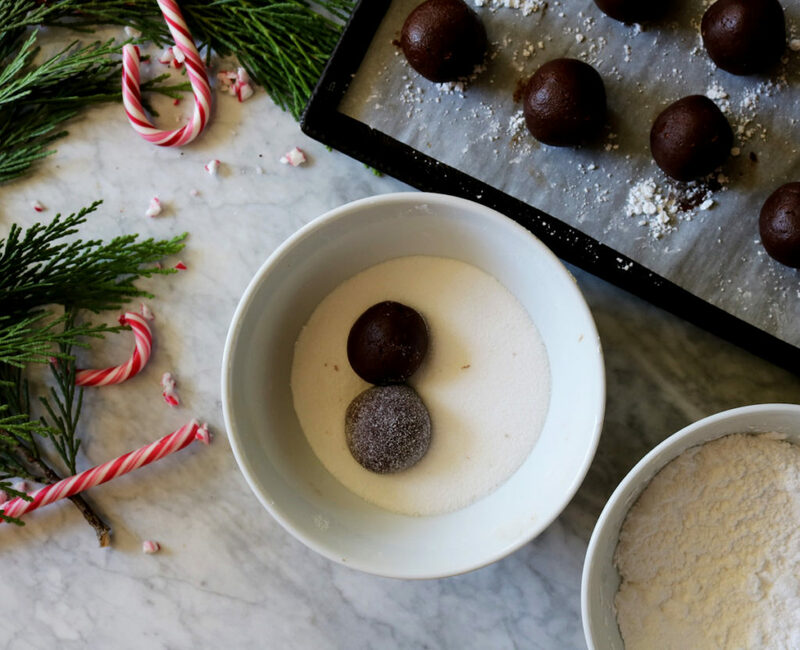 Consider all of your holiday cookie needs sorted. Pop that champagne…let’s get baking!! 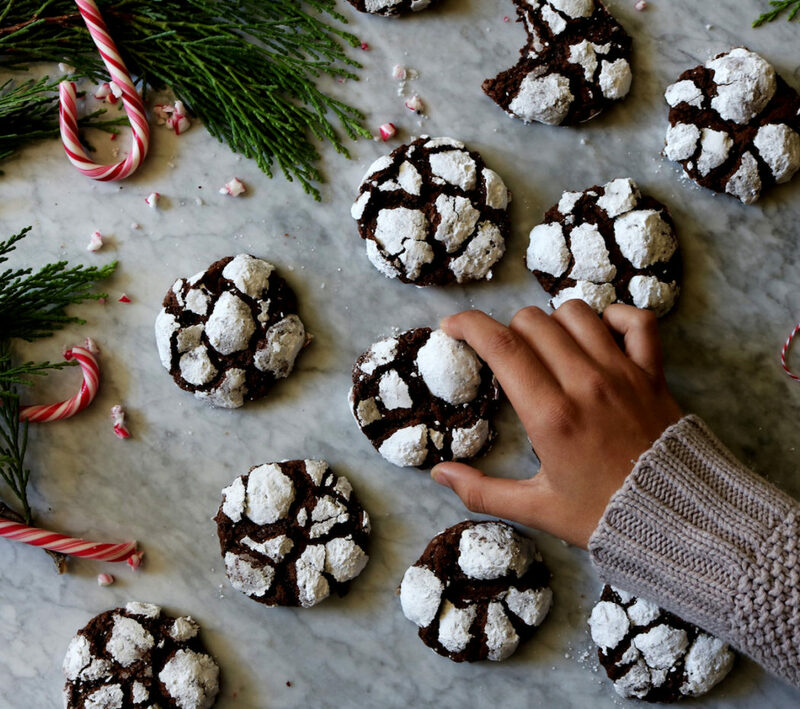 I made these Chocolate Peppermint Crinkles for Asha, from Food Fashion Party…who I adore. And if you’ve been reading me for awhile you know that I’ve mentioned her a handful of times. Her recipes, photos and stories are just filled with warmth and love and personality. AND, I was lucky enough to receive cookies from Amisha, The Jam Lab. Amisha is so talented. Not only is she a talented baker (and cook!) but she also has a beautiful line of jams that are simply incredible (and would make amazing stocking stuffers). She is so kind and thoughtful. The cookies she sent to me are a gorgeous shortbread infused with Indian spices, dipped in white chocolate and coated in pistachios and rose petals. Stunning. All of these bloggers are people I have come to admire. They are talented beyond words. I hope you’ll take the time to look at each of their cookie creations. You’ll be dazzled. Join us in using the hashtag #holidaycookieparty2016 across social media when you make + post any of these cookies or make your own holiday cookie. Let’s get our bake on!! Put the butter, semi-sweet chocolate and milk in a large, microwave-safe bowl and melt in the microwave for about 1 minute. Take out of the microwave and stir. Stir until smooth and the mixture has no lumps. Your microwave may need 10 more seconds or 10 less…error on the side of less and then add more time in small 5 second increments so that you don’t burn your chocolate. Add the brown sugar and granulated sugar to the chocolate-butter mixture and blend. Whisk in the eggs and peppermint extract. Set aside. In a medium bowl, whisk together the bread flour, cocoa powder, baking powder, baking soda and sea salt. Add the flour mixture to the chocolate mixture. Blend in as few strokes as possible. Lay some plastic wrap on the counter, dump the dough on there, wrap tightly and refrigerate for at least 30 minutes. The dough will be sticky and tar-like…refrigeration will make it easier to handle. Preheat oven to 375 degrees F and make sure you have a rack in the top 1/3 of the oven. Put 3/4 cup each of powdered sugar and granulated sugar in separate bowls to roll the cookie dough in. Cover your baking sheets with parchment paper or a silpat. Get about two tablespoons of dough and plop it into the granulated sugar and cover completely. Don’t shake any sugar off…leave it pretty well coated. 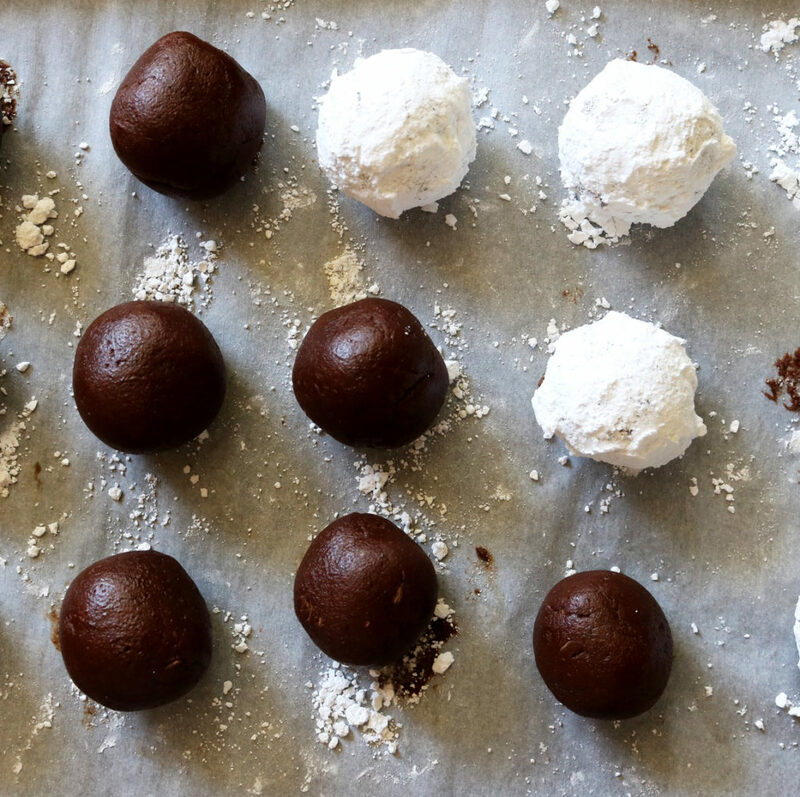 Then roll the balls in the powdered sugar. Again, don’t shake off the excess. Make sure the dough is covered well in both sugars. Place the covered dough balls on the baking sheet, about 2 inches apart from each other. Bake for 12 minutes. Don’t over bake…they will be soft and appear underdone when you pull them out of the oven. 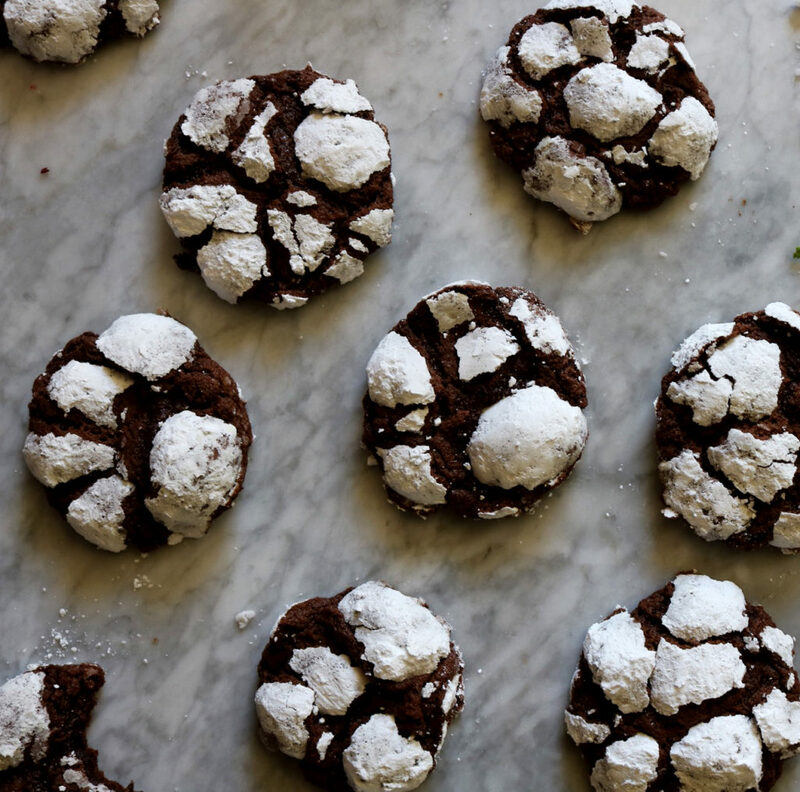 Let the chocolate peppermint crinkles cool on the sheet for 15 minutes. Then remove the cookies from the cookie sheet and place on a cooling rack. You can take it from here. Try these with coffee (in the morning) or some red wine (at noon) or some whiskey (at night). 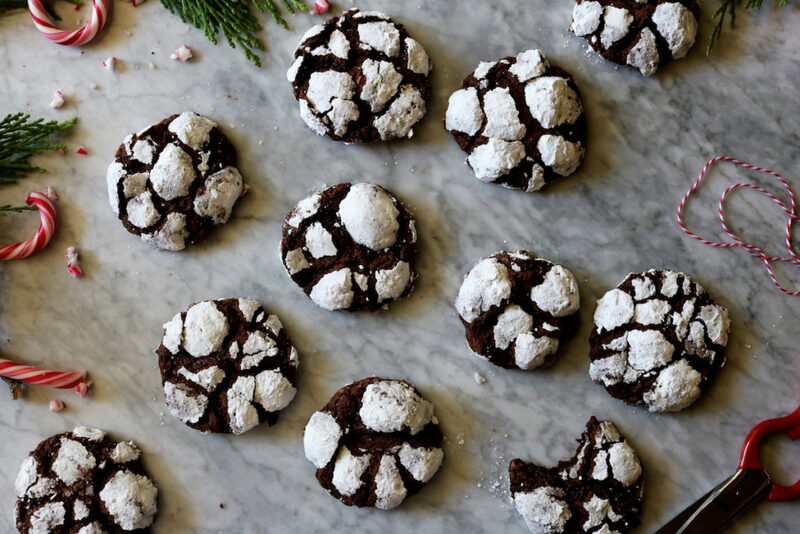 Thanks for making these Chocolate Peppermint Crinkles!! Please tag me so that I can see them @displacedhousewife #displacedhousewife and for holiday cookies add #holidaycookieparty2016. PEACE. This cutie wrote a love letter to my Pumpkin Spice Chocolate Chunk Cookie…and I love her for it. Thank you Augustina!! What are our thoughts on Westworld. A bunch of you recommended it while I was sick over the holiday. I like it. I’m into it. I can’t help but feel that the women are decoration…in much the same way they are in Game of Thrones. Thoughts? I like that the two strongest characters are women…but the eye candy is always lurking in the sidelines. I also really loved Stranger Things. I’m looking for any and all recommendations. I’ve been in a binge-watching mood. Leave them in the comments below!! Here’s an interview with Ina. I love her. I want her barn. Her life seems pretty dreamy. Or is it just me? Brett, I know you’re with me… Anyone else? More Holiday Treats: Cranberry Bark Peace Cookies, Cranberry Pecan Baked Apples, Candy Cane Ice Cream With Chocolate Pudding Cakes, Double Chocolate Peppermint Bark Cookies, Chocolate Peppermint Bark Crinkles, Cranberry Spice Breakfast Buns, Cranberry Scones, Salted Caramel Pumpkin Cheesecake, Five Spice Cranberries (three ways), Apple Spice Cake, Boozy Sugared Cranberry Cheesecake, Pomegranate Rosemary Cocktail, Easy Labneh Appetizer, Persimmon Salsa, Port Cranberry + Apple Petite Rosette Tarts, Pomegranate Burrata Salad, Fresh Fig + Toasted Pecan Salad, Bacon Brussels Sprout Slaw, Baked Cranberry Apples and Five Spice Cherry Pie. Next week I’m heading out to Napa to hang with the coolest group of food people around — I can’t wait. I will be posting the whole thing on IG Stories, Instagram and I just might revisit Snapchat again…it faded off of my radar…but I’m thinking I’ll bring it back. Thoughts? Hi!! Do you think I could sub peppermint essential oil for the extract? Looks so freakin yummy!!! These look amazing!! I’ve never made cookies entirely with bread flour though, and am a bit nervous. Just wondering how they’d be different from cookies made with all AP flour? Ah, I can’t wait to try these beautiful cookies, Rebecca! I hope my crinkle cookies turned out this majestic :) Thanks for organizing this cookie exchange and including me in on the fun! Can’t wait until next year! Thank you for these cookies, my cookie box and for organizing this wonderful exchange and for including me. Rebecca, these were one of the most decadent, delicious, most amazing textured cookie every. They are JUST PERFECT like your friendship. You truly are the kindest for mentioning with such warmth. Love you loads. These are gorgeous, Rebecca! All those knooks and crannies are a feast for the eyes. Can’t thank you enough for creating this fun event and for brining every one together to celebrate the season. Happy Holidays! Would it be possible to make these with all purpose flour instead? these are my favorite christmas cookie! i can’t wait to try your version (and check out 17 new cookie recipes)! holiday hugs to you! I love crinkle cookies! These just scream Christmas movie night and a huge glass of milk! Can’t wait to try them! These crinkles are da bomb! HUGE thank you for hosting. I was so happy and honoured to be included. AND, I can’t wait till next year! This was truly the best way to kick off the holiday season – baking, friends, love. Can’t beat it. Happy holidays Rebecca. I hope this festive season is truly merry and bright. These are my favorite cookies every season. I love that you rolled yours in two different types of sugar. I never do that. It makes yours perfectly gorgeous! I simply love these Chocolate Peppermint cookies! I love love crinkle cookies and they are sooo festive! Simply LOVEEE the pics here! and I am so happy that I got to send to you – a person I simply admire a lot! Thank you for including me in this wonderful party! :) I thoroughly enjoyed it! What party should we do next?? ;) A holiday drink party hehe! I’m absolutely in love with these crinkles! Chocolate and peppermint is one of the best combos, and nothing beats a gooey chocolate cookie :) I wish we could taste ALL of each other’s cookies – they all look and sound so delicious. Thanks so much for including me, I can’t wait to drool over everyone’s recipes! I totally agree Rebecca, these crinkles look AMAZING! I am a chocolate peppermint cookie girl through and through at holiday time! Can’t wait to try your recipe. Thanks again for including me in an amazing group of bloggers! I can’t wait to check out everyone’s recipes! i don’t blame you for making mint chocolate cookies every winter; it’s such a good combo and somehow it never seems quite as appropriate outside of winter time!